How does your introversion or extroversion affect your actions and interactions in various groups? Do you even know whether you’re an introvert or extrovert? Knowing and using your personality type to manage your environment is a game changer when it comes to stress levels, personal satisfaction and your energy. Last fall, I attended a fairly large women’s conference in a beautiful remote camp in the Central Oregon high desert. Roughly 400 women came together for a weekend of learning, rest, fun and excitement. Since it’s a camp that primarily caters to teens, there were crazy skits and SNL-esque sketches at each meal. There was a ropes course, and waterslides open in the frigid 50-degree weather. There was a coffee bar, a craft station and a gym. In my younger years, I would have thrown myself in full-throttle to be part of it all. And I would have exhausted myself doing so. That would then require either a whole lot of down-time to recover or a cycle of pushing myself beyond my limits creating unidentifiable stress and anxiety. My outgoing personality didn’t automatically make me an extrovert. This introvert needs alone time to recharge. I often surprise people when I tell them I’m an introvert, because apparently I project a fairly authoritative, confident demeanor – regardless of what I’m feeling inside. This weekend, I had a mental map of what I wanted to accomplish for the weekend. 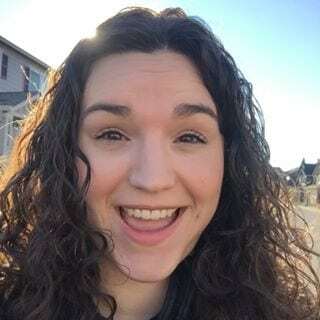 It included getting up early, exercising, having alone time, connecting with a few ladies I don’t get to see that often and generally doing all.the.things. Are you laughing yet at how overly ambitious this was? You should be. The reality hit that I was so overloaded on life that I didn’t want to interact with anyone. I was perhaps borderline rude as I answered questions during mandatory interaction time (i.e. meals) with single words or short phrases. While I was genuinely happy to see people, I simply didn’t have it in me to put myself out there even more. Free time hit, and I decided to take a short nap before reading and doing some work. That “short nap” ended up taking the entire afternoon. Apparently I was more tired than I realized. However, because I had that nap, when I had a chance encounter with an old college friend that I hadn’t seen in almost 15 years, we were able to spend an hour and a half catching up and it was so refreshing to my soul. I do much better with small groups and interactions than with large groups. Give me a group of 2-6 people, and I can talk for hours. In a group of 8, 12 or 24, I will likely shut down. It’s too much for me to take in. If I don’t shut down, it’s because I’ve been able to carve off a smaller group/conversation with those closest to me. For the longest time, I thought something was wrong with me and that if I simply tried harder, put myself out there more, slept less, then I could be the version of myself that was in my head. I like the bustle of being in and around large groups. In high school, I was the one who had 20 people over to my house after youth group each week. When I look back, while I was polite to everyone, I only had deep interactions with a few at a time. I could move from small group to small group within the larger context, but one large group in and of itself was never appealing. Maybe this is how cliques start out innocently. We all need a safe place to be ourselves, and some of us do that better in small groups. As an introvert, I need alone time to recharge. I do better in small groups, even among a crowd. There’s nothing wrong with me (well, at least not here). It’s simply how I’m wired. How do you interact in groups? Are you left recharged or needing refueling? 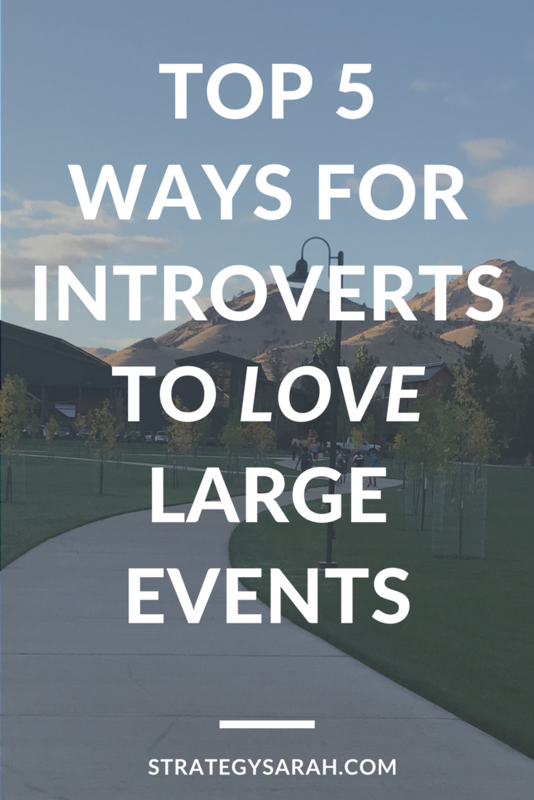 If you’re an introvert like me, here are five tips to fueling up and truly enjoying large group events. 1. Review your schedule before and after the event. If there aren’t great times to recharge while you’re at the event, can you get extra alone time beforehand or afterward? 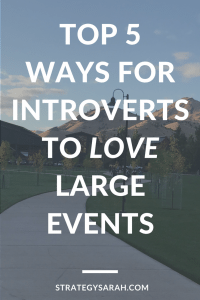 If you can carve off introvert-time before and after an event, that can and should affect how you plan and use your time at the event. Depending on the extent of your exhaustion and the type of the event, you may use these tips to decide if going to an event in the first place even makes sense. 2. Review the schedule and identify where you can find time to recharge. Is there free time in the schedule? Is there a scheduled activity that you can skip? There are times that skipping a scheduled activity to leave space for personal connection during free time can be a great way to go. Many larger conferences and events record sessions, so you may not even have to fully miss the content you signed up for. In my case heading into this particular weekend, my brain and my body were a mass of chaos, stress and exhaustion. I definitely didn’t have downtime before arriving, and was headed straight back into the tornado when I got home. This meant I needed to carve off introvert-time at the retreat. 3. Explore the venue to find space to be alone and recharge. Is there a quiet nook? A walking or hiking trail? A tucked-away corner of a big room? If the only space available is still a public space, consider strategically using headphones to create private space – whether or not you’re actually listening to something. 4. Lean in and be fully present when you are present. The point of finding time and space to recharge is to be able to fully experience and enjoy the times you do participate. Prioritized ahead of time what you think those moments will be, and leave space for the chance encounters. You won’t regret it! 5. Adjust as you go. Like I said earlier, I had ambitious plans going into that weekend. Fortunately, I quickly realized what was going on, reassessed my capacity, and adjusted accordingly. I ended up having a wonderful weekend where I made meaningful connections and recharged. Want to learn more about personality types? Pick up Reading People by Anne Bogel, my favorite overview of the various personality frameworks and how they impact our daily lives.